Elegant, Spacious, Sea-View apartment - only adults allowed. free WiFi. 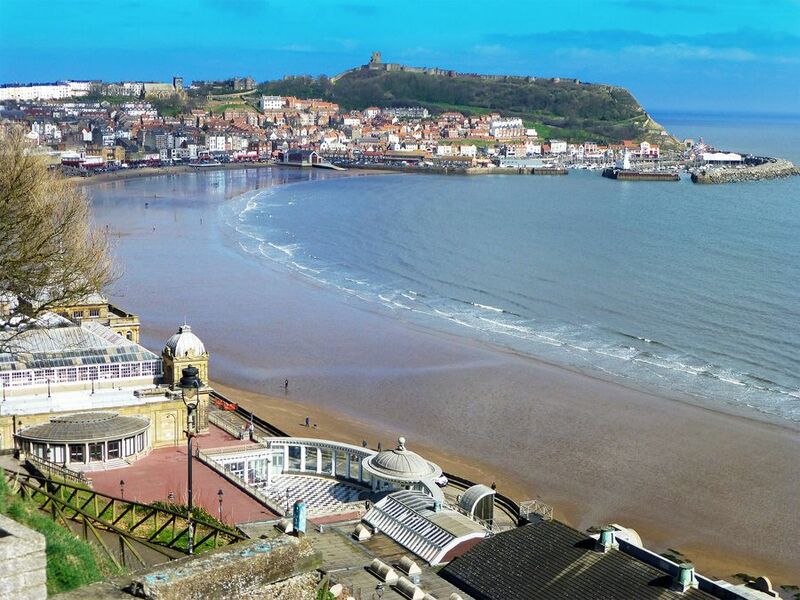 We Wouldn't Stay Anywhere Else In Scarborough! We have stayed in Seascape 3 times now and we love it! 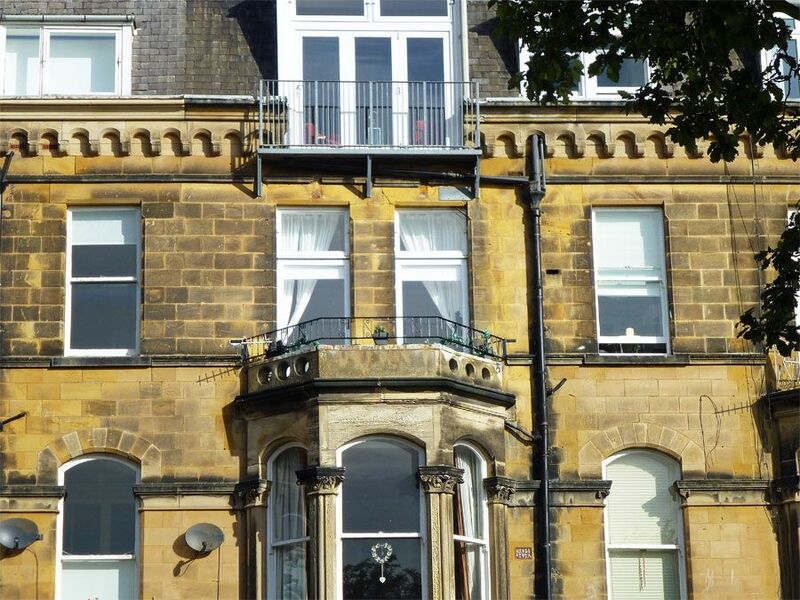 It is the perfect holiday retreat in Scarborough. The location is spot on and the flat is beautiful. We love the character and amount of natural light that floods the living space on a sunny day. The sea view from the balcony is the cherry on top of the cake. The flat is always spotless and well equipped. 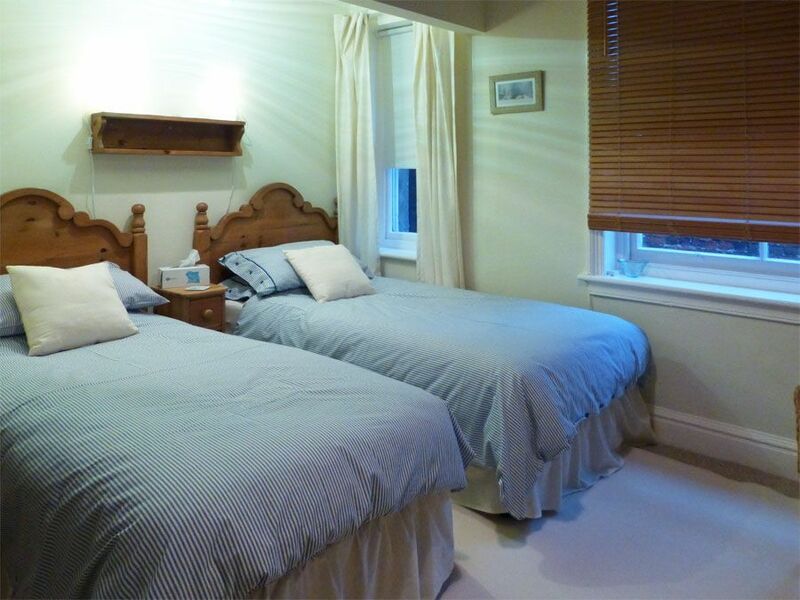 The beds and seating is comfortable and it has a lovely homely atmosphere. So much so, that we always struggle to leave. The booking experience is always pleasurable from beginning to end. 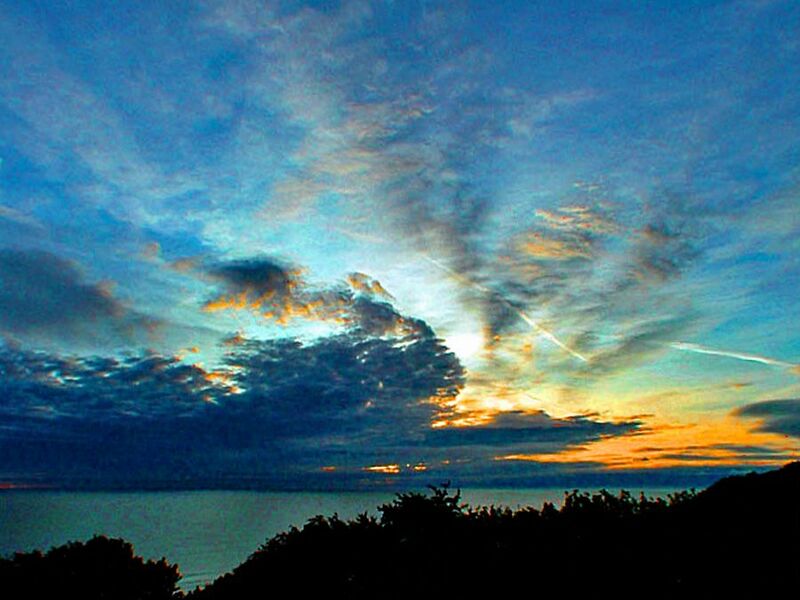 The only drawback is the stairs to climb, but it's worth it for the views and the comfort! 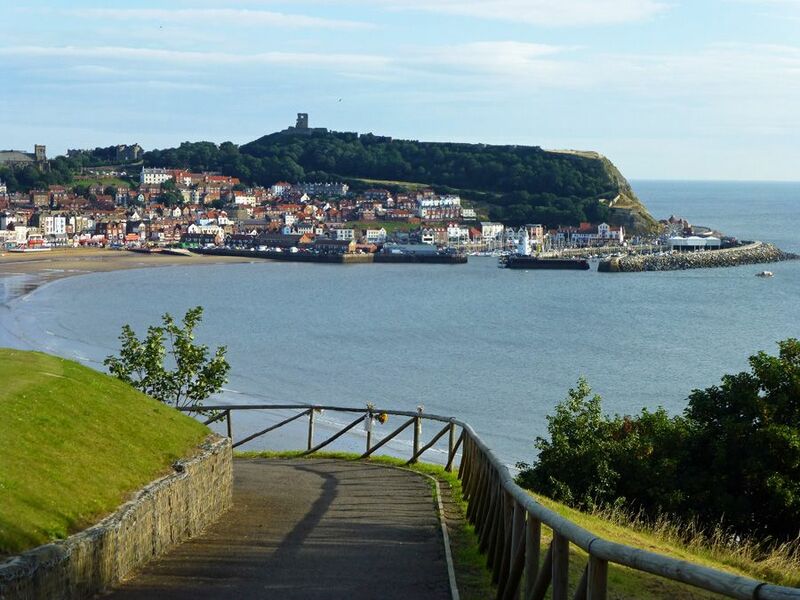 We shall continue to stay at Seascape for many years to come, we couldn't stay anywhere else in Scarborough now. 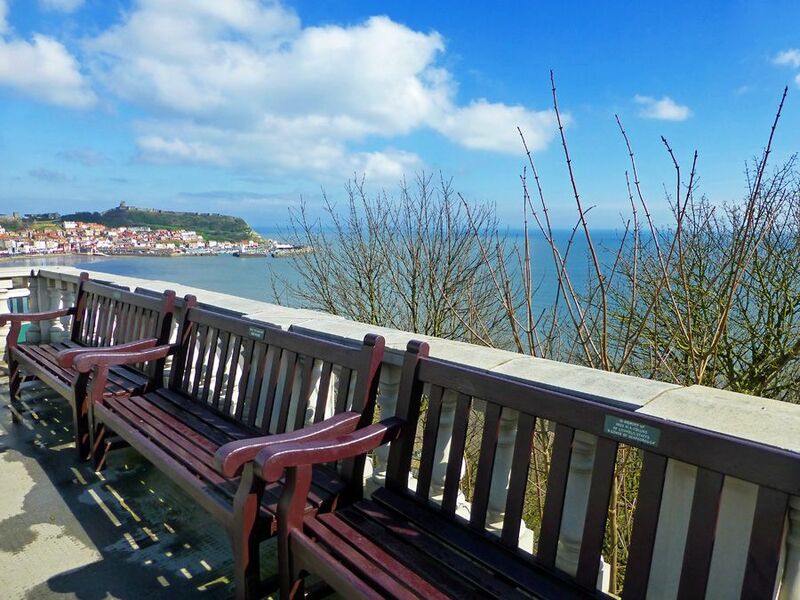 Superb Sea View apartment overlooking Scarborough Esplanade. NOTE: ONLY ADULTS ARE ALLOWED. Guests appreciate the very large rooms, high ceilings and tall windows at Seascape - typical of the fine houses of this period. 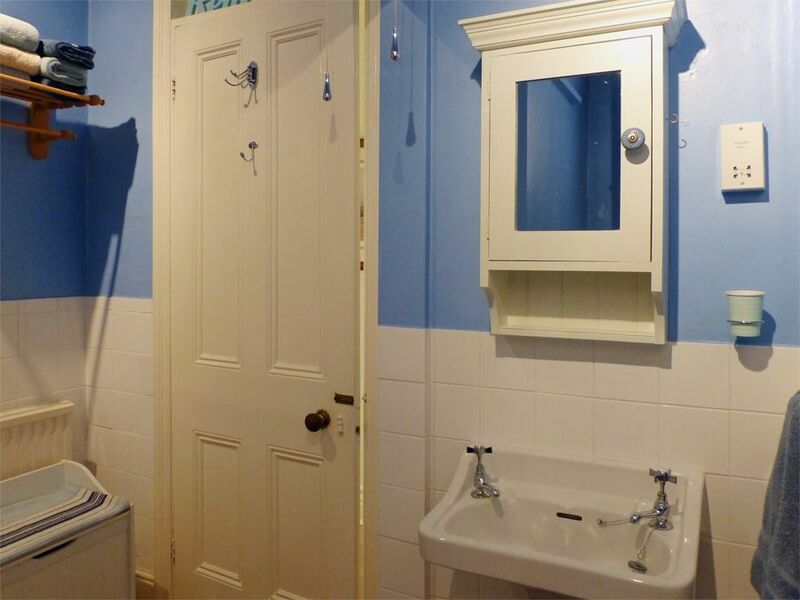 On arrival, you enter through the main communal doors into a well-kept hallway. Wide carpeted stairs take you to the 2nd floor where Seascape is situated. The apartment has its own hallway opening to the kitchen and the lounge. The sea-view lounge is large and luxurious. This south-facing room is flooded with light for most of the day from tall French doors. Furnished with a 3-seater sofa, and a big comfy armchair, there's also a large flat screen TV, DVD player and plenty of DVDs, books and games.. Guests love to relax in this beautiful spacious room, which overlooks the Esplanade and the sea and opens to a delightful little balcony. There's a large dining table with chairs to the rear of the lounge. The property owners have also placed 2 chairs and a small table on the balcony so guests can have breakfast or evening drinks outside. 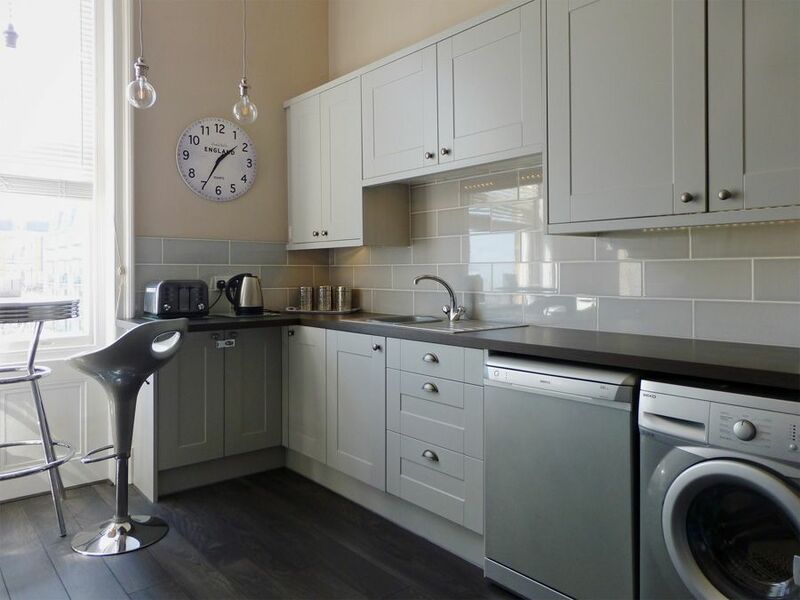 Self-catering is a pleasure in the brand-new, quality kitchen. 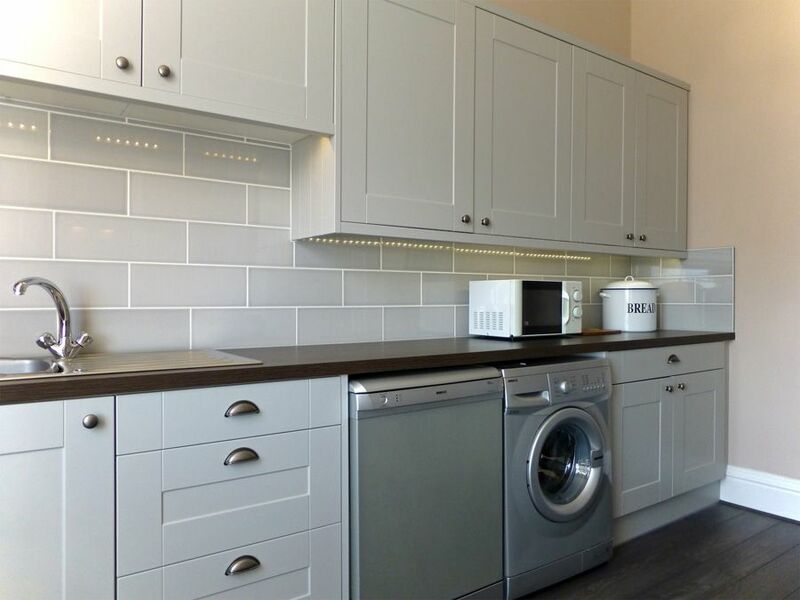 You'll find everything you need including a ceramic hob, washer, dishwasher and fridge/freezer. The owners of this property make sure there's a good supply of all those useful items you may not have brought with you - such as cloths, kitchen roll, bags, and cleaning materials. 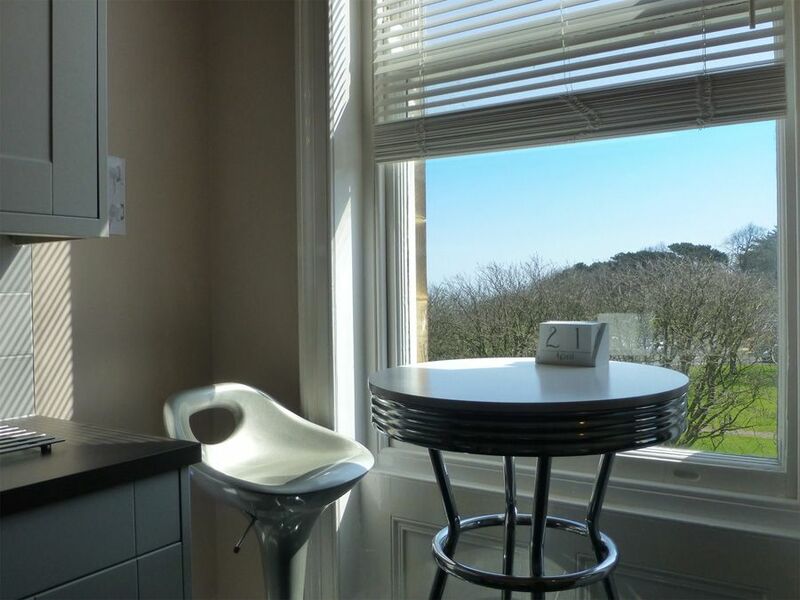 A breakfast table is positioned at the huge kitchen window giving more lovely sea, garden & Esplanade views. 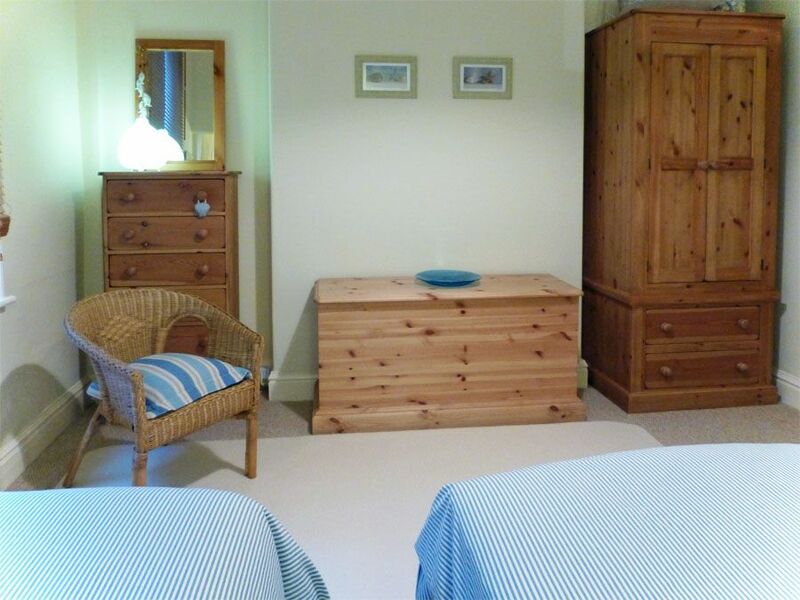 There are two, excellent, high-ceilinged bedrooms (1 double, 1 twin) with wardrobes, drawers, bedside cabinets and reading lamps. 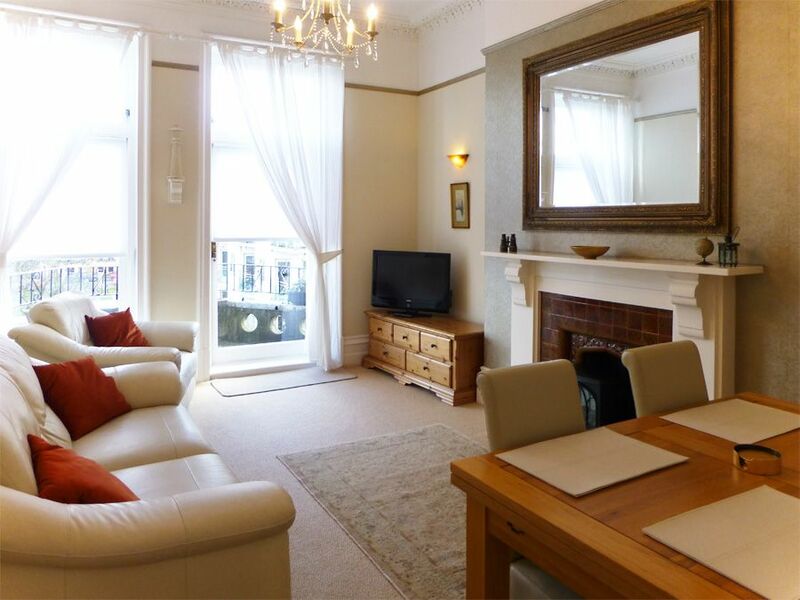 Both have large windows, loads of space and are tastefully and very comfortably furnished. The master bedroom has a TV and a dressing table. 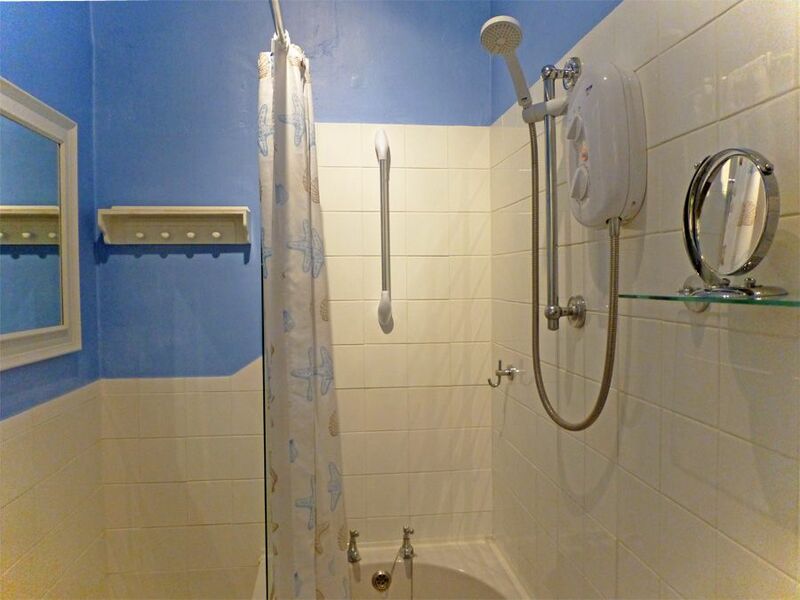 The lovely bathroom has a bath, WC, washbasin and electric shower over the bath. Towels and bath mats (including a non-slip one) are provided. Warmed by a central heating radiator and an overhead fan heater. 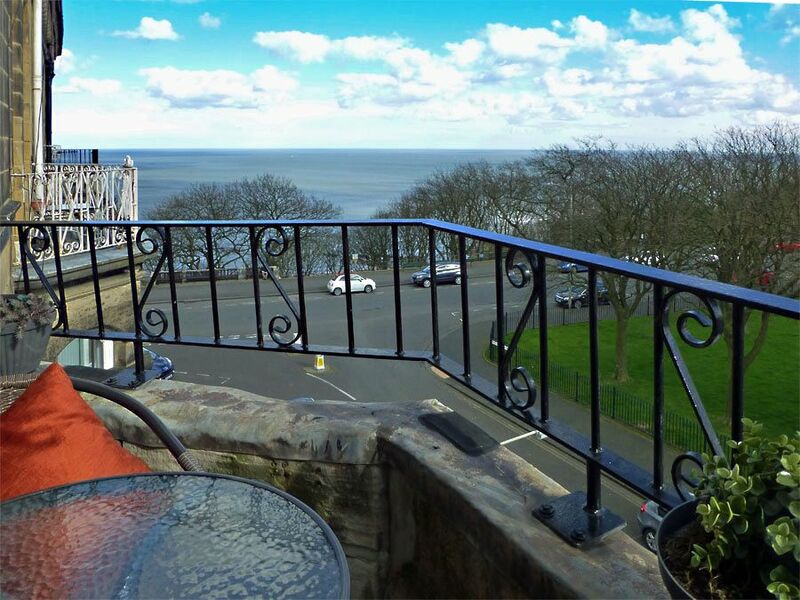 When sitting on the balcony you have a glorious 180 degree view ..... of the open sea to the left, the coastline and Esplanade straight ahead, and Oliver's Mount to the right. Beds are made up ready for your arrival, with linen to suit the season. 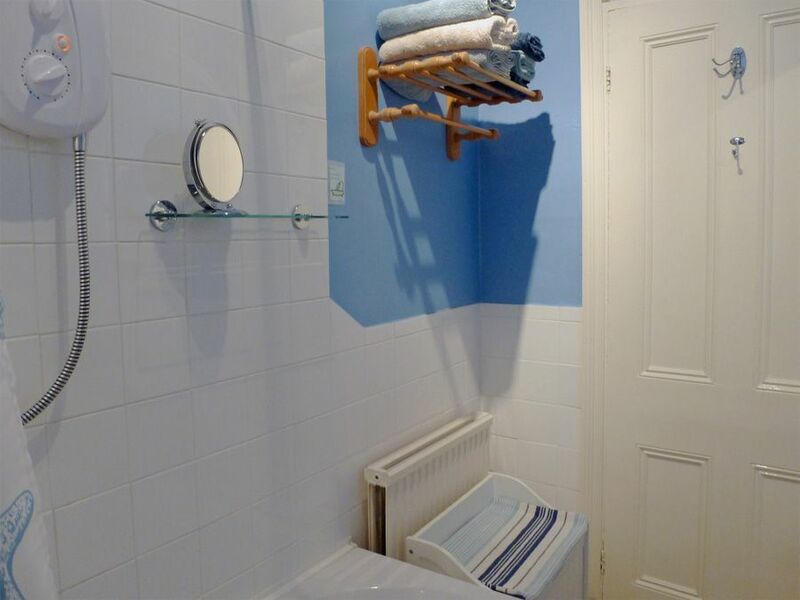 Bath, hand and tea-towels are also provided (please bring your own beach/swimming towels). You will always find a good selection of books, games and DVDs. Also provided are an iron, board and airer. Hairdryer. Cleaning equipment and materials. 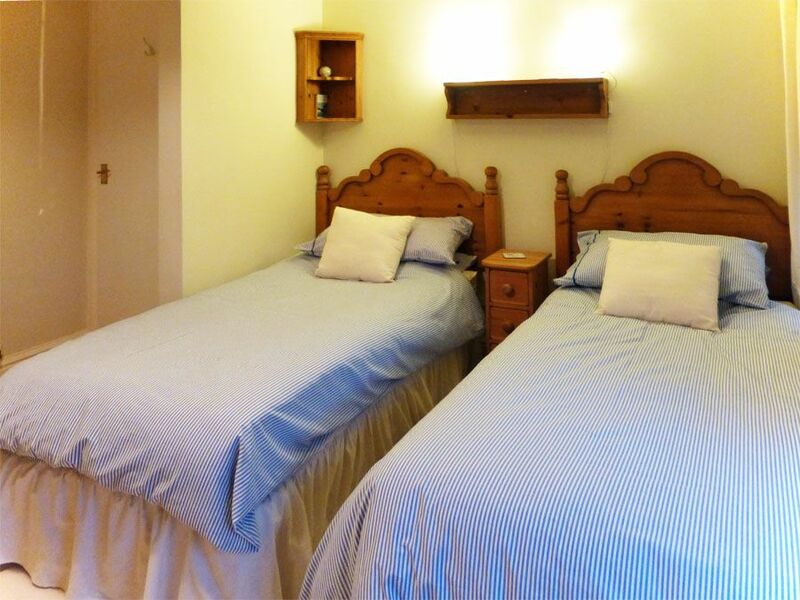 As with all Bedwyn's accommodation ... there are no meters and no hidden extra charges. Parking permits (to allow free on-street parking in the vicinity of the flat), are provided for the duration of your stay. Please indicate when booking if you require permits for more than 1 vehicle. You can usually get parked very near the property - even in High Season. Seascape is always warm and welcoming, well heated with plentiful hot water, so is equally inviting in winter and in summer. .
Seascape Apartment is in a fantastic South Cliff location, just off Scarborough's famous Esplanade and across the road from the Cliff Lift and South Cliff Garden paths.... which take you to the South Bay Beaches and Spa Theatre. The shopping parade at Ramshill (Sainsbury's Local open till 10pm, pharmacy, post office, hairdressers) is a few hundred yards inland. 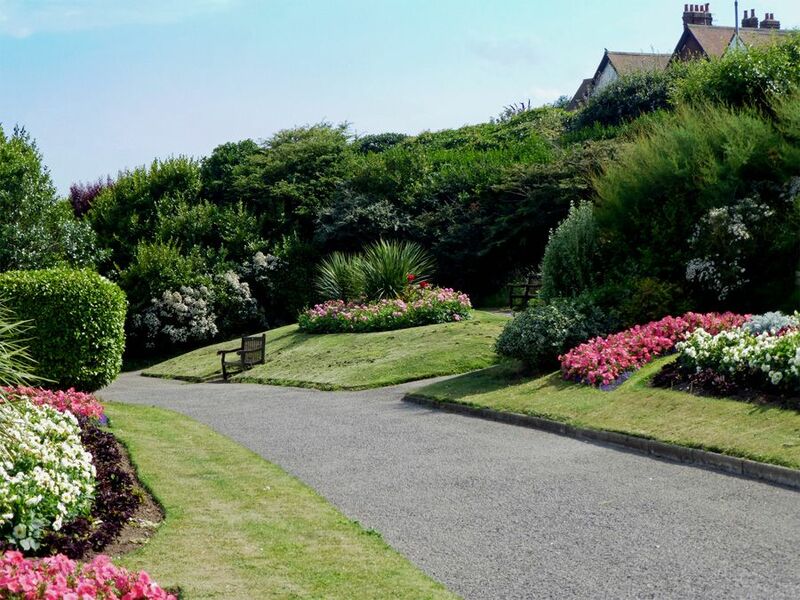 It's only 10 minutes' scenic walk to The Spa Footbridge which spans the valley between South Cliff and the Town Centre. A 5-minute car journey takes you right into Town or down to the Foreshore, harbour and piers. You're spoilt for choice for cafes, restaurants and take-aways at Ramshill, and there's a choice of hotels offering drinks and dining on the Esplanade... just around the corner. NOTE: ONLY ADULTS ARE ALLOWED. Sorry no pets or smoking permitted. ACCESS: Although the flat is on the second floor (up 4 flights) the stairs are carpeted, wide and have good sturdy handrails. ..and once you are up there the view is worth it. The accommodation is set out over 2 levels - 5 steps leading down to the rear of the flat (where the bathroom and 2nd bedroom are situated). Our 4th visit to Seascape and a lovely one again The flat was just as good as the 1st time excellent and so homely everything you need and more The flat is so well maintained and immaculately clean and has everything you need basically home from home The balcony view is great and flat is in a great location That's why we have come back for the last 4 years. Would recommend staying here 100% Thank you Bedwyn's for a lovely stay. We have stayed here at least 5 times in past 7 years. 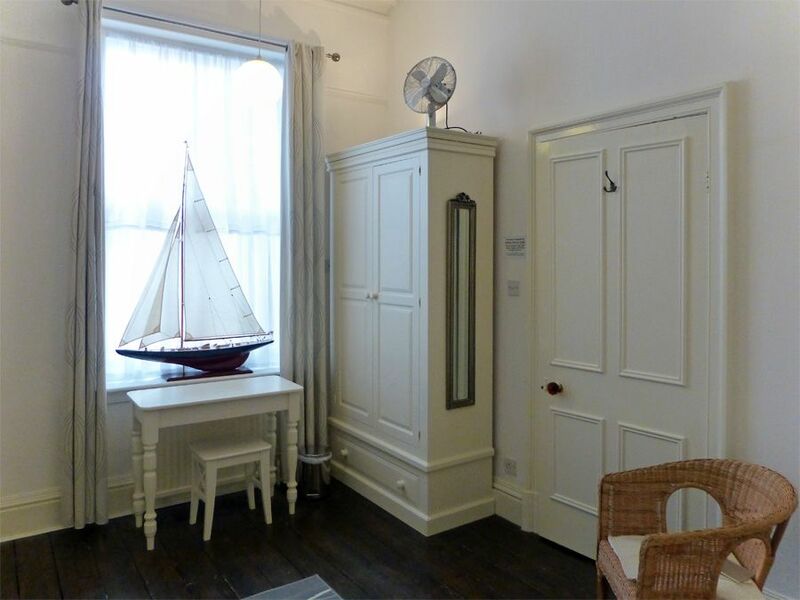 It is superbly fitted out with everything you could possibly wish for - and more. Nice little extras like milk in fridge and choccy biscuits greeted us on our arrival. A real bonus is the little balcony beyond the living room. 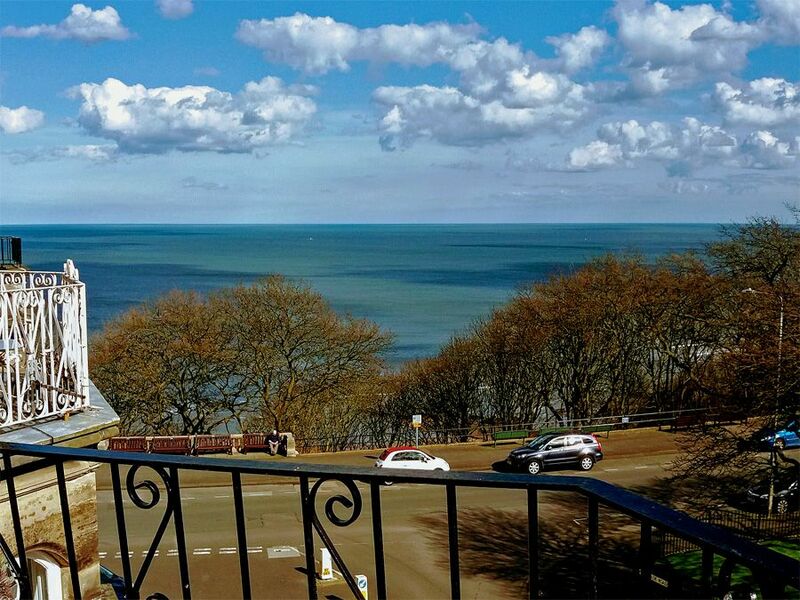 We were blessed with glorious weather on our recent stay and enjoyed chilling out on the balcony with views of the sea and South Bay Cliff/Gardens. The flat is always spotlessly clean and there are clear instructions about everything. Every year we say we'll return, and we do! Hope to have many more holidays in this great apartment. 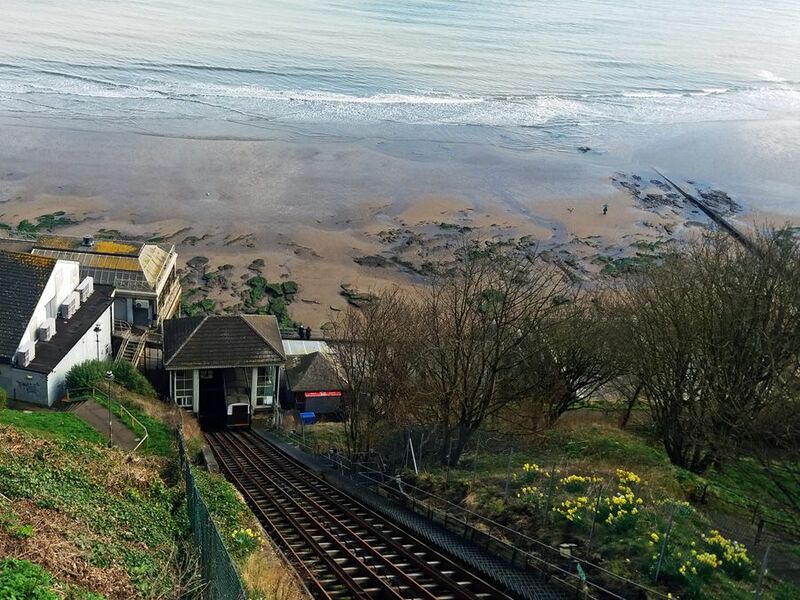 Having made a last minute decision to spend a few days vacation in Scarborough, we then happened upon a late availability opportunity at 'Seascape', located on the resort's South Cliff. 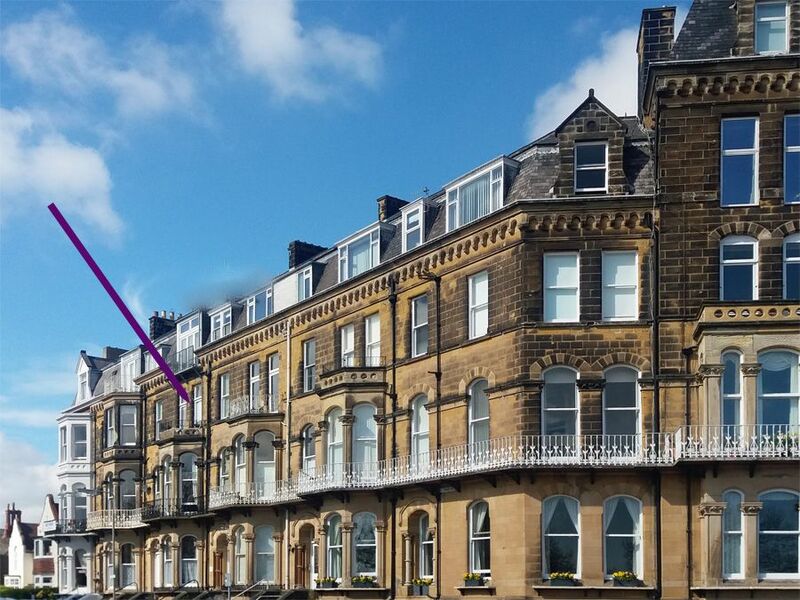 The luxury of this Victorian-period apartment with beautiful sea views from the balcony certainly enhanced our holiday with 'every comfort of home'! 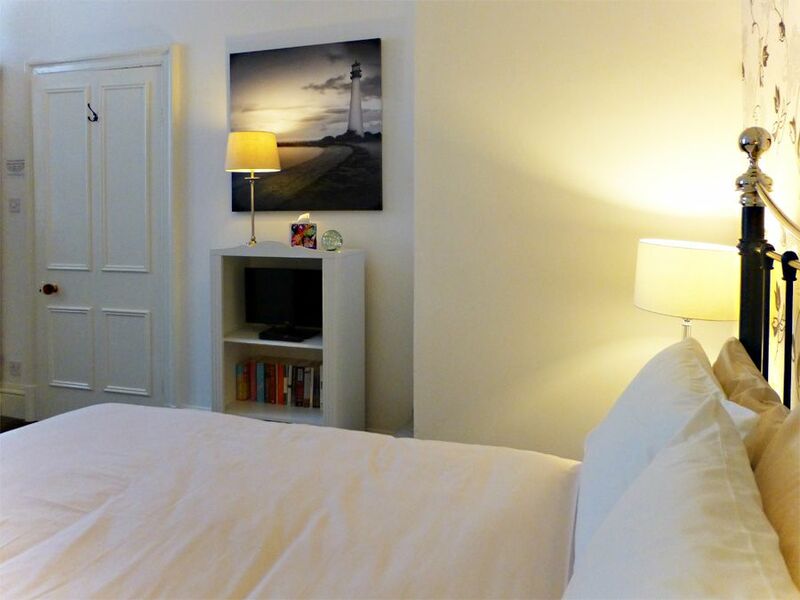 Spacious, immaculately clean and stylishly furnished rooms where every modern convenience is provided - from hair-dryer and dishwasher to fresh bed linen and towels. One's every need is taken care of in exceptional attention to detail. The lovely welcome of initial supplies of coffee, tea, milk, biscuits etcetera, was a real treat! Thank you so much, we truly enjoyed every moment in this beautiful apartment and hope to return to repeat the experience, again and again. The moment we entered Seascape we just could not believe we was in a rented holiday flat. The entire flat was perfect the decor, furniture, everything you needed for a comfortable stay, cleanliness was 100% Parking scratch-cards were all left and explained so no worry about parking. If I was going to North East Yorkshire again I would go when Seascape was available. Thank you for a great stay we are still talking about it 2 weeks after we arrived home. Winter in Scarborough. 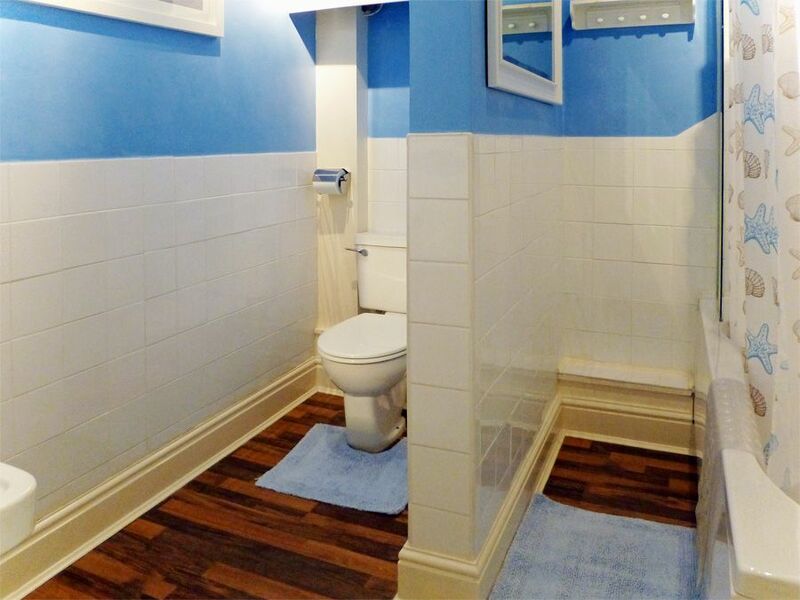 The flat is in an excellent location with views out to sea. It is very well equipped, comfortable and well heated. There are lots of hotels and restaurants within walking distance if you want to eat out in the evening, mostly at reasonable prices. 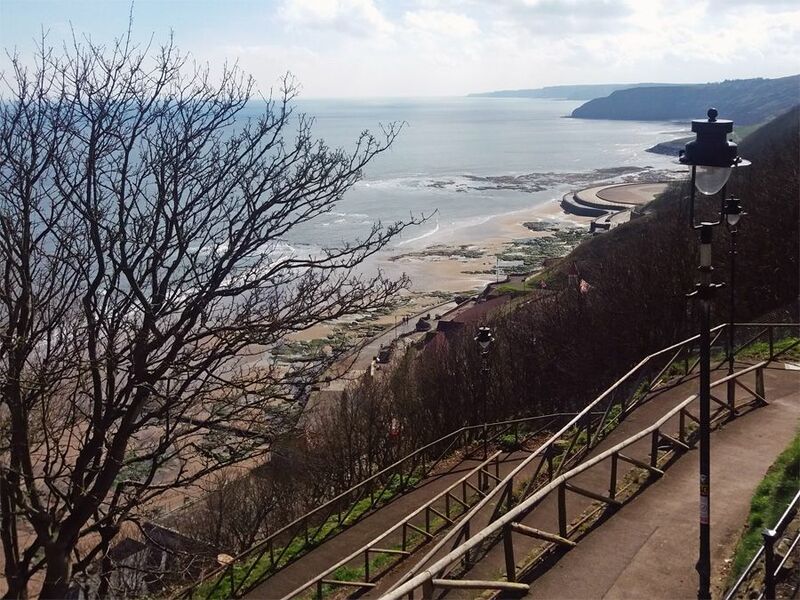 There are 4 flights of stairs to the flat so you do need to be reasonably fit but why else would you be in Scarborough in Winter if not to walk along North and South Bays and enjoy the sea air and views along the coast and the porpoises and the waves breaking over the sea walls and the sea birds and etc. etc.? 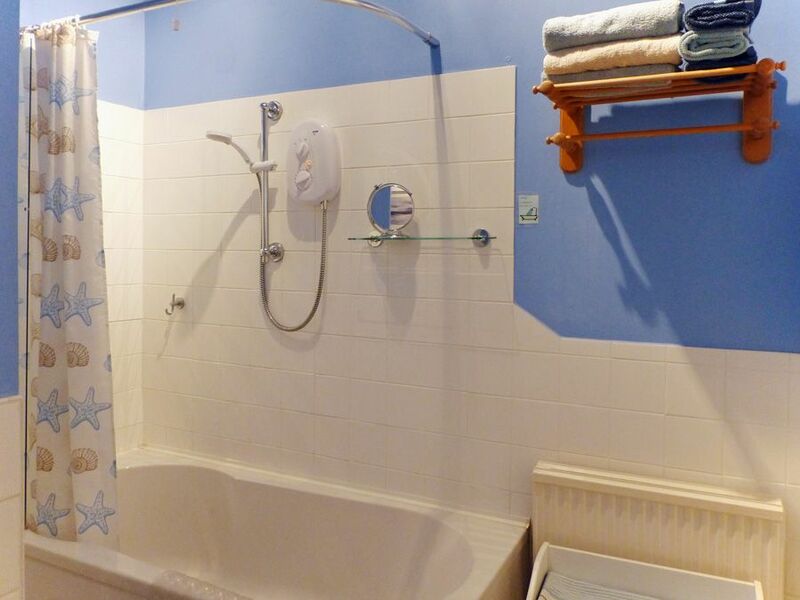 An excellent flat with everything you could possibly need to make the holiday very special. 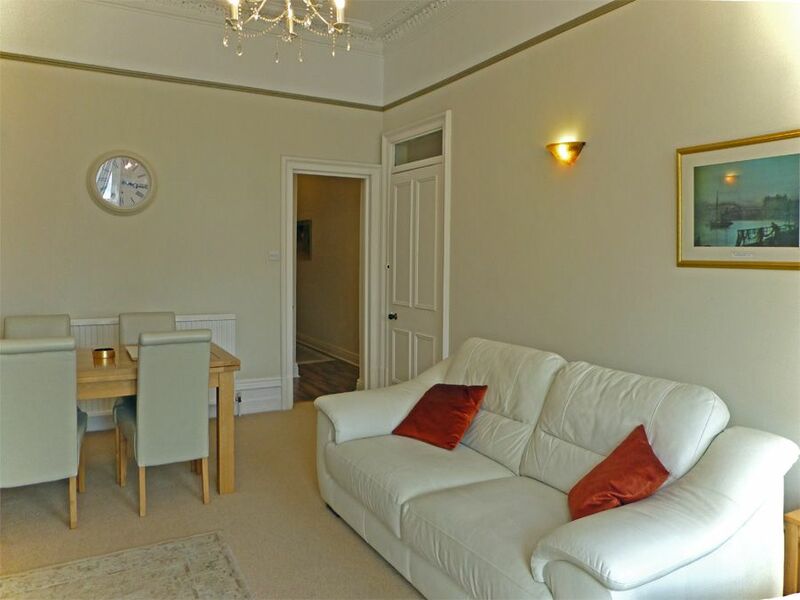 Very good location as the flat is close to the spa lift making easy access to Scarborough's attractions. Perfect. We stayed at Seascape the first week in July. The photos on the website do not do this gorgeous property justice. It is stunning.. So much bigger than we expected. My Fiancé and i stayed the entire week in the master bedroom and my parents came to stay a few days in the twin room, the bedrooms are quite spaced out and not next to each other so you feel like you have your own space and not all cramped in. 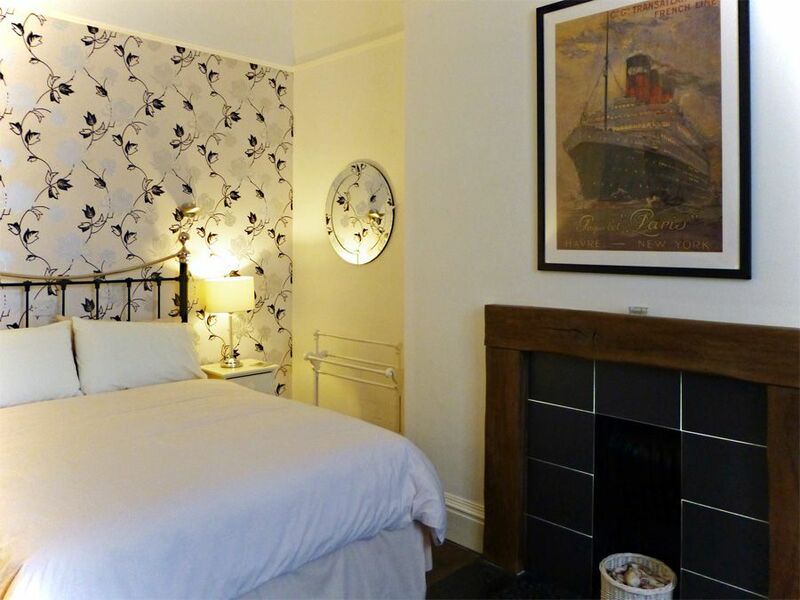 All the rooms are bright, tastefully decorated and modern. Theres everything you could possibly need, Especially in the kitchen. Theres a huge selection of dvds,books and games. 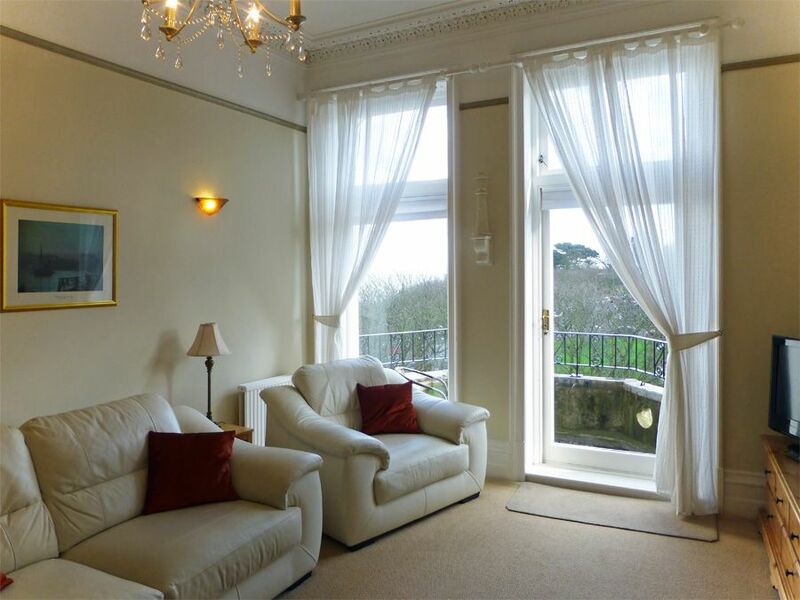 The lovely living room was a delight to spend time in and the sea view balcony was the cherry on the cake. 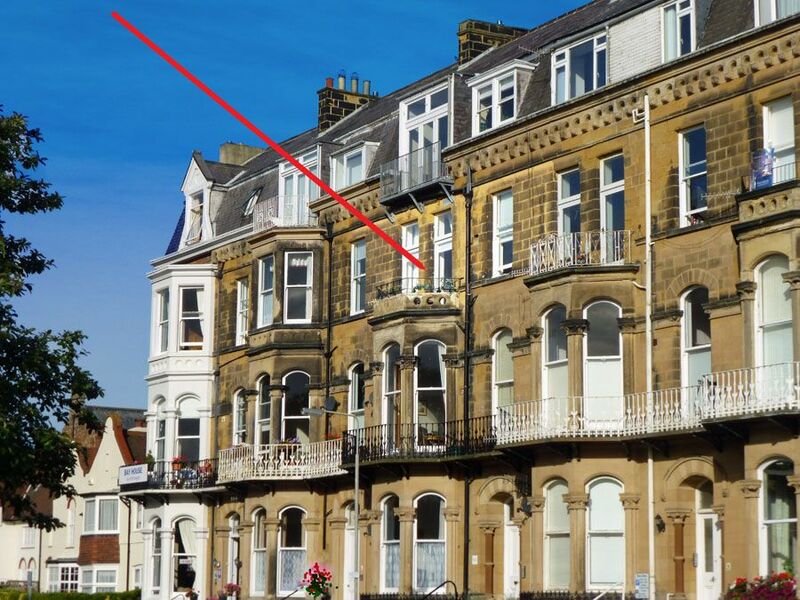 Its the nicest place i have ever stayed in Scarborough, and ive been coming since i was a child-almost 40 years. 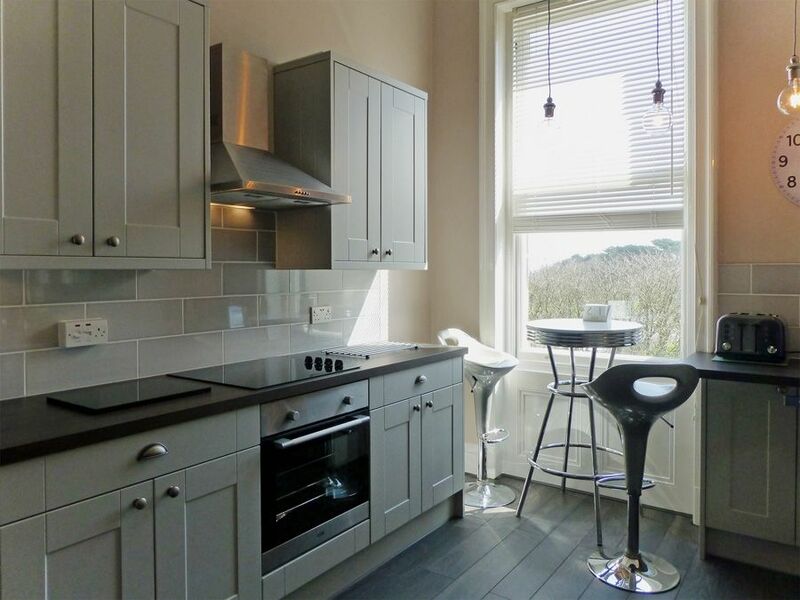 The flat itself is perfectly located as it near enough to eveything in Scarborough, and enough out of the way not to be disturbed by noise of the south bay front. Beautiful Italian gardens around the corner and the best italian restaurant on the end of the road. 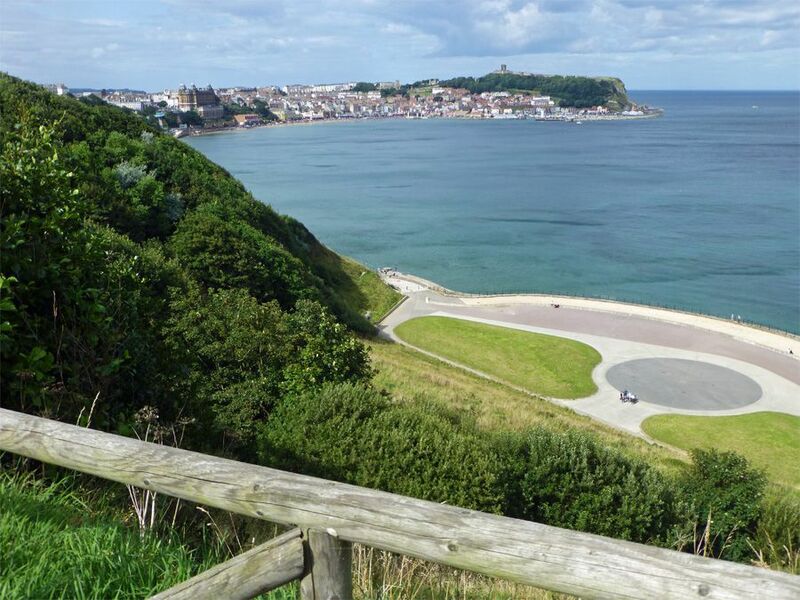 We also had the best weeks weather weve ever had while visiting Scarborough. The arrangements for the flat keys is perfect aswell, very convenient and easy. The only down side is having to go home. We will definitely be booking to stay again. The best holiday accommodation ever!! Absolutely fabulous holiday accommodation, well appointed with super balcony so you can relax in the fresh air while enjoying the sea view. Very well equipped with everything you could possibly need and more. Super clean, which is a priority for us. We have stayed every year I think since 2010 and will always keep coming back. I would recommend this place to everyone, unreservedly! A great place to stay & a great area to be in. A good walk out to the town centre & to the beach. Local shops easy to get to. Clean, spacious very well presented, well equipped, etc we could not fault it, An all round great place to stay. We really enjoyed our holiday at Seascape. 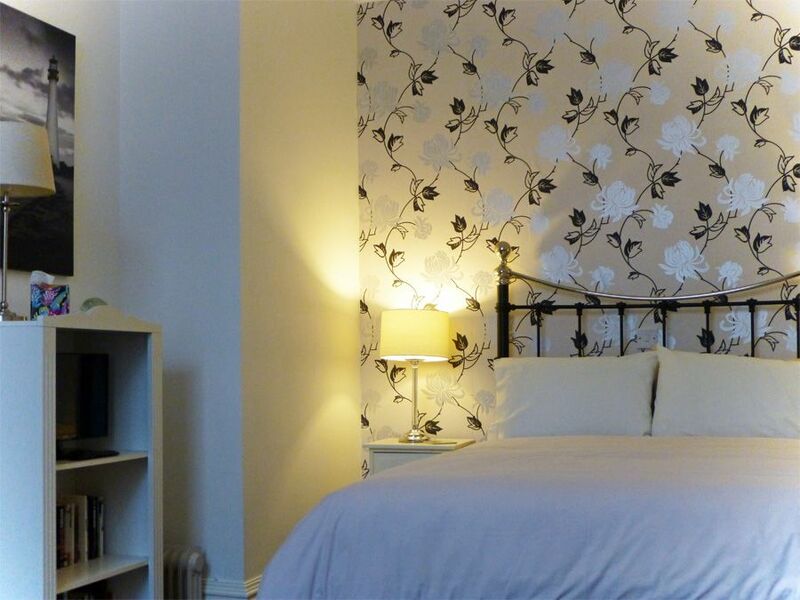 The flat was spotless and comfortable and the owners had put a lot of thought into our stay. Well placed for the beach and town. 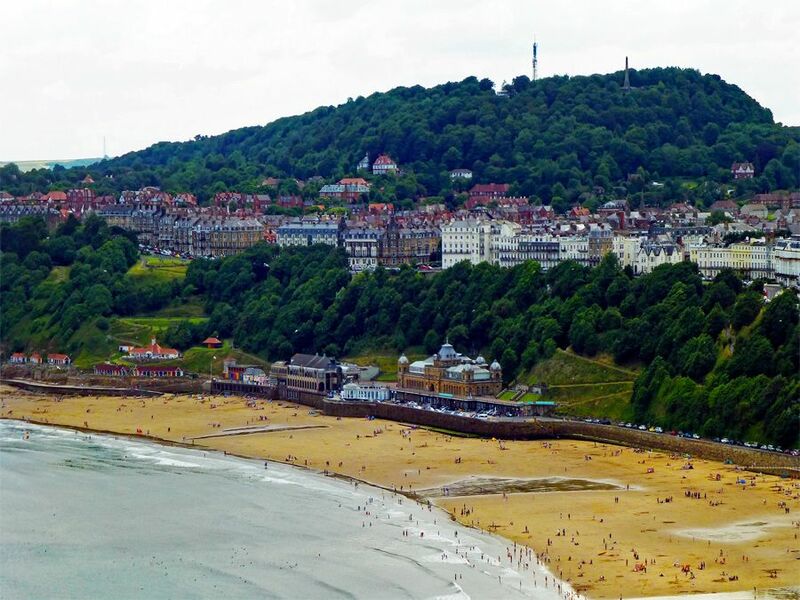 After visiting Scarborough for many years and staying in hotels I found Seascape on the internet just in the right location to visit the Spa. What a find! A beautiful apartment fitted out with everything you could possibly want. Think this will be our Scarborough home from now on. Already booked for next year.